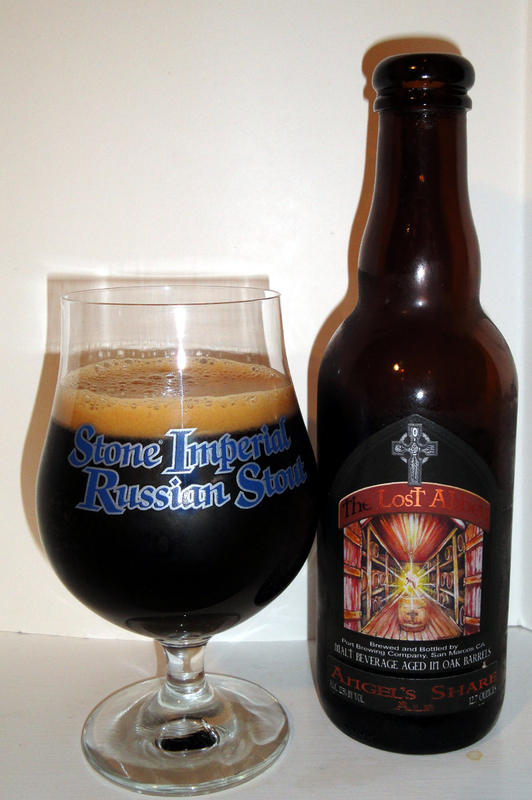 How served: 12.7oz caged and corked bottle poured into a Stone Imperial Russian Stout glass. I paired this beer with: nothing. It was used as an after dinner drink. Tasted on: Tuesday April 20th, 2010. Note: 2010 vintage. There has been a lot of noise that Angel Share has no head as is completely flat. Well as you can see there was a nice headed poured from this bottle. This head lasted for a few minutes and then thinned out and would reappear again if the glass was swirled. Now the beer itself was almost totally flat after the pour, but a beer like this you do not need much carbonation to make it enjoyable. The first thing I tasted was a very rich chocolate taste, then a hint of bourbon and vanilla, then the heat of the alcohol hit, wow what a great tasting beer and mouthfeel. This is for sure a sipper and one which you hate to see the last drop gone from your glass. On the Label: Way down in Kentucky and across the pond in Scotland, distillers age their whiskeys for many years in oak barrels. Over time, some Whiskey is lost to evaporation. They refer to this loss of spirits as “The Angel’s Share.” Each time a barrel is filled, a measure of liquid seeps into the oak and is lost for forever. Our Angel’s Share is a barrel aged burgundy colored ale infused with copious amounts of dark caramel malt to emphasize the vanilla and oak flavors found in the freshly emptied Bourbon barrels. Each batch spends no less than 9 months aging in the oak. As with all of our beers, this beer is brewed for sinners and saints alike. So be an angel and share it with a friend or two. From their website Down in Kentucky and across the pond in Scotland, distillers who age their whiskeys for many years refer to the evaporation of the spirits from their barrels as “The Angel’s Share.” We couldn’t agree more. Each time a barrel is filled, a measure of liquid seeps into the oak and is lost for good. This striking Strong Ale is brewed with copious amounts of Caramel malt to emphasize the vanilla and oak flavors found in freshly emptied bourbon or brandy barrels. The beer spends a year in oak before it is packaged for release. The beer is 12.5% ABV and is available in 375ml and 750ml bottles and on draft at inspired locations. It’s warehouse #5 built in 1886 that gets the most attention. The other four weren’t built so well and succumbed over the years. On the outside, to most #5 is a rather unremarkable white washed building. That is until they pass through the weathered doors and are easily consumed. Here in the hallowed halls it just oozes history. Inside this three story building, they find row after row of whiskey slumbering away the days until the distiller calls their name and they are called into action. It’s a weathered building with a timeline of over one hundred and twenty years of continuous service. Looking around, there is a warm orange glow from all the wood inside. On both sides of the room for as far as your eyes can see, there are wood racks with carvings, nicks and dings. It smells sweet in here. Could that be the Whiskey breathing? Perhaps it’s the angels doing their work? Or is there just something sweet about 200 year old wood that intoxicates your sense of smell. Imagine the history that belongs to the wood in this “shed.” It comes from seeds that were planted when the idea for the Revolutionary War was just fermenting. And it’s still here, every single day telling the story of this distillery. This warehouse has seen it all. It survived the harsh winter of 1913. There was the Tornado in 1956 and who can forget the flood of 1973? But, it’s still here. Still working, living and breathing whiskey as great grandpa designed it to do. Sure, there are more cobwebs and spiders than there used to be? It’s an old building after all. One of the family members proclaimed it to be a grand old warehouse of monumental importance, so now it’s on the National Registry of Historic Buildings. Yet, the premise has always been the same. We need a place to age those spirits. And #5 has always been there. Way down in Kentucky and across the pond in Scotland, distillers age their whiskeys for many years in oak barrels. Over time, some whiskey is lost to evaporation. They refer to this loss of spirits as “The Angel’s Share.” Each time a barrel is filled, a measure of this liquid seeps into the oak and is lost forever. Our Angel’s Share is a barrel aged burgundy colored ale infused with copious amounts of dark caramel malt to emphasize the vanilla and oak flavors found in freshly emptied bourbon or brandy barrels. Each batch spends no less than 12 months aging in the oak. As with all of our beers, this beer is brewed for sinners and saints alike. So be an angel and share it with a friend or two. How served: 650ml capped bottle poured into a Triple Petrus glass. I paired this beer with: a Gyro platter. Note: Bottled on February 19, 2010. Bottle says you can age this up to 5 years, so I drank this one fairly fresh. I’ll save my other bottles to try in 6 months and then a 12-18 months to see if this changed for the better or worse with aging. 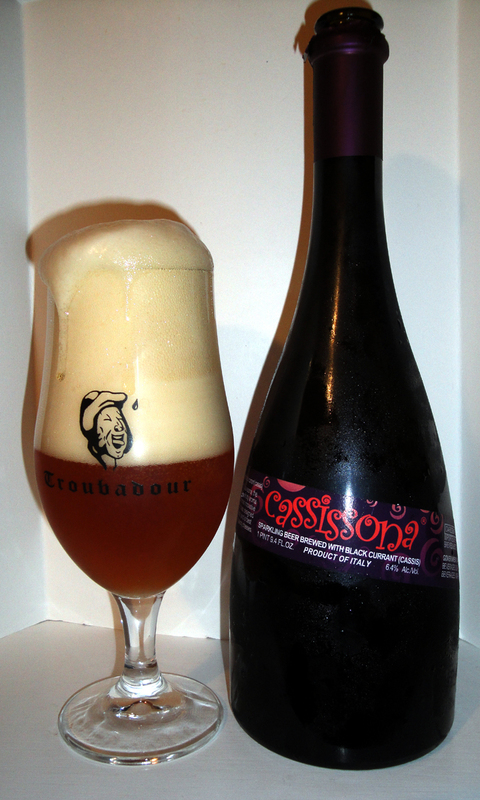 As Saisons go, this is on the “light” side of tartness and funkiness. However there is still a lot going on in this brew as it was well balanced for a farmhouse ale with hints of citrus and pepper. It was quite refreshing. I will be looking to try this one again. On the Label: Develops in the bottle for up to 5 years. Contains live yeast. A sediment may form. 80% Belgian style ale blended with 20% Belgian style ale aged in wine barrels with orange peel. 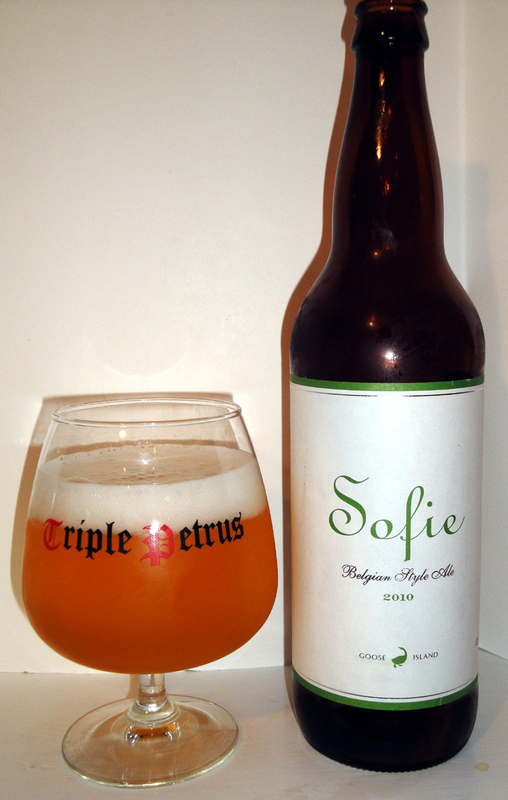 Food Pairings: Sofie pairs with a wide variety of foods, its light and refreshing qualities complement lighter flavors like fresh oysters and contrast rich shellfish like lobster. How served: 22oz bomber poured into a Duvel tulip. I paired this beer with: Grilled and smoked turkey burgers topped with Habanero pepper sauce and corn on the cob. Tasted on: Wednesday April 14th, 2010. Note: Best by Date: 04/16/10, whew, I made it by 2 days. 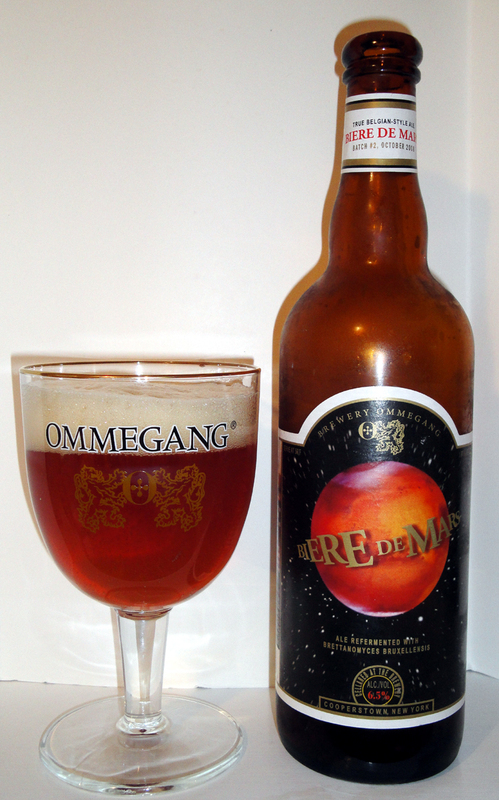 This beer paired better with this same meal then yesterdays, Bière de Mars. This IPA cut thru the heat of the hot sauce better. This beer is listed as an Imperial IPA, but to me drinks and smelled more like an IPA, a good hoppy one at that. If it wasn’t for the 8.75% abv this would be a fantastic brew for a session, & I would be careful if you choose to do so. Overall I was very pleased with this beer, too bad it is not sold in Florida, at least not yet. On the Label: Stonehenge is a mystery. Hop Henge is a discovery. Our Monument to hops- Hop Henge is brought to life by the uncompromising creativity of our brewers. With an immense hop flavor and bitter finish. This experimental IPA will stand the test of time. 95 IBU’s. From their website: This is a Bond Street Series Beer: Inspired by the original Deschutes Brewery & Public House on Bond Street in downtown Bend, the Bond Street Series highlights a handful of our hop-forward beers that began at “the pub.” These local favorites, both old & new, truly display Deschutes Brewery’s diversity and creativity. Available in 22 oz bottles and draft only. 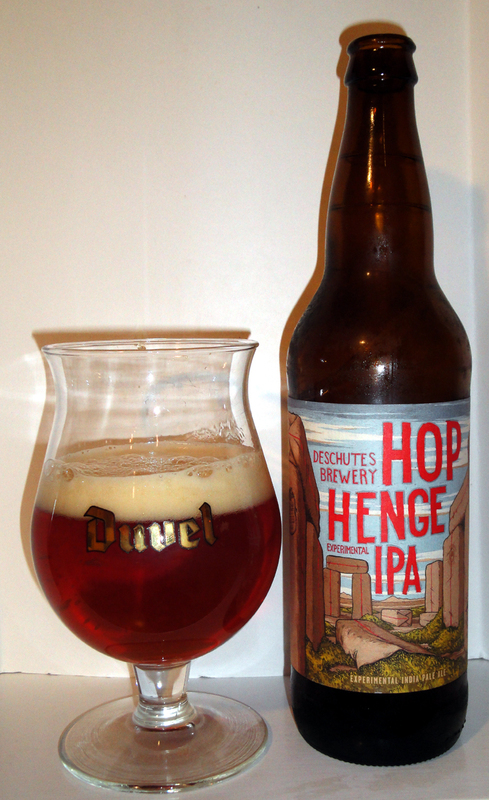 First brewed in 2006, Deschutes Brewery’s Hop Henge Experimental IPA reappears this year with more extreme hop flavors than ever before. The new formulation is the epitome of the brewery’s experimental style and commitment to innovation, while gratifying their unquenchable thirst for beautifully balanced hoppy beers. The newest incarnation of Hop Henge uses several new hop processes and techniques to create a truly unique and unexpected beer. Several pounds of Centennial & Cascade hops are in each barrel with a heavy dry-hop presence to top it off. A blend of crystal, pale and carastan malts creates an overall biscuity characteristic that is dense and muscular, building the alcohol base to support the monstrous hop profile. Hop Henge started its life as an India Pale Ale, but this year it was bumped up to “Imperial IPA” status, with a hefty dose of additional hops. 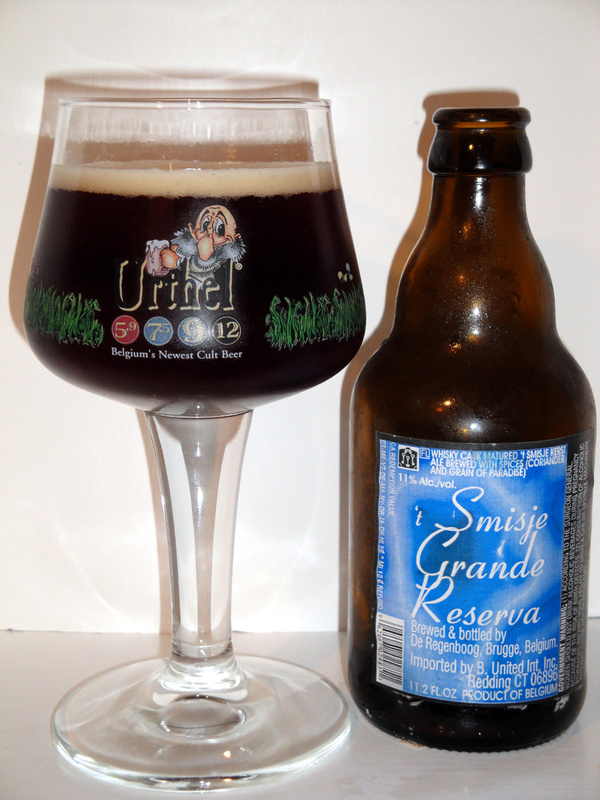 It pours out a deep amber, with an appealing rocky head, and rich hop aroma wafting from the glass. “They sure dosed it with a lot of hops…[there’s] a lot of hop bitterness in the taste,” one taster observed. In addition to the Imperial-level hopping, Hop Henge also boasts Imperial-level alcohol content, with 8.1% a.b.v. “Not for the timid,” said taster Robert Lachman. How served: 22oz capped bomber poured into a Boerinneken glass. I paired this beer with: Grilled tilapia with a spicy marinade. Tasted on: Wednesday April 7th, 2010. Note: This was fermented with cracked peppercorn, but I had to use my imagination to taste any of the peppercorns in this beer. The label says Lip Stinger, so I was expecting a little bit of a spicy bite, but there was none. Now to put this in perspective, I love habanero peppers, the hotter the better, so my taste buds are immune to “low heat” and that is a possible reason why I didn’t detect any heat in this beer. Otherwise this was just your run of the mill Farmhouse Ale, nothing to set it apart from the middle of the pack in this style. It was a good beer, refreshing and went well with my meal. 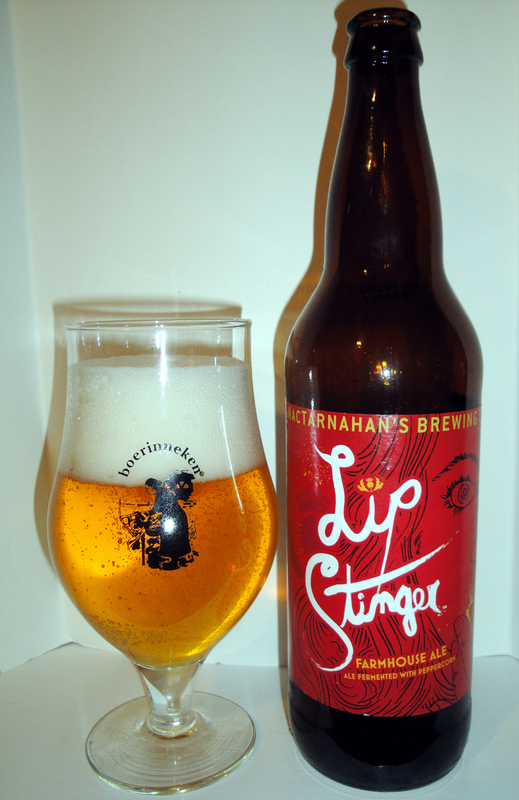 Lip Stinger is an effervescent and rustic farmhouse ale. This limited release ale is fermented with cracked peppercorn to introduce a spicy nose and warming mouth feel that will deliver a flavor sensation that is endlessly interesting. Enjoy the heat….and no pouting! !